We have decided to offer TrialPay checkout method for CD Label Designer. For all those who are unfamiliar with TrialPay concept: instead of paying for license, you are now able to choose and complete one of offers presented. Offers include, but not limited to: joining various networks, subscribing to different newsletters or purchasing from some other company. Some offers are free, some are not, so check terms for each one. Upon successful completion, TrialPay will inform us and we will send you free registration key for CD Label Designer. Currently, you can choose from more than 100 offers. You can be sure that you will find something that you need! To take an advantage, go to CD Label Designer purchase page and choose “Free with TrialPay” link. This entry was posted in CD Label Designer on November 2, 2007 by vradmilovic. 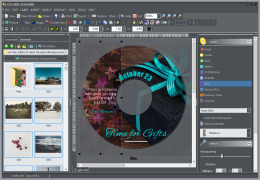 CD Label Designer 3.5 is available for download. Update contains several minor improvements and bug fixes. Upgrade is highly recommended and free for existing users. Just download new version and install it over the existing one. CD Label Designer is application that will help you to design and print CD jewel case and DVD box labels, booklets, round and business card disk labels. It supports images, RTF, circled texts and shapes allowing you to arrange, change size, angle and transparency of objects. You can read directory and file structure, CDDB audio CD database or define own lists to include them on labels, and you can customize printout positions. This entry was posted in CD Label Designer on November 1, 2007 by vradmilovic.